USING JAIKU to pose a question that will arise on the anniversary of the Irish Internet Association's tenth anniversary, Krishna De wonders if anyone makes money while blogging. I have always thought that perspective is too capitalistic, assuming that every measure of merit must have a direct monetary aspect. Instead of trying to distill direct monetary value from blogging, I think one should value the impact of blogging on a wider spectrum of measurement. Doc Searls puts it this way. "It’s going to dawn on people that not everything needs a business model. And that far more money is made because of the Net, blogging, Linux, IM, and even businesses such as cellular telephony, than is made with any of those things." NEC HAVE a wireless camera that can be powered by a fluorescent light. All you need to do is simply attach a ring-shaped component for power acquisition to the bulb. This is a lot more convenient than having to wait for the sun to break through Irish cloudy skies. And since you can run your fluorescent lights all day without drawing anyone's notice, you can also use your spycam around the clock too. The camera uses electromagnetic induction in order to obtain power by using the magnetic field generated by the AC source (45-100kHz) in the fluorescent light. This wireless camera will be operable at 120mW and is capable of automatically adjusting the frequency of shooting video in response to the power supply from the fluorescent light. The camera shoots images every 10 seconds and supports VGA (640 x 480), QVGA (320 x 240) and QQVGA (160 x 120) resolutions. Image transmission is made possible via IEEE802.11b-compliant wireless LAN. See the NEC wireless camera at the iExpo2007 in Tokyo Big Sight from Dec 5-7, 2007. JOHN COLLINS has singlehandedly made The Irish Times an essential Friday purchase for his coverage in "Business This Week" and today he delivers the same high-quality round-up of business and technology that earned him plaudits as an outstanding technology journalist in several industry events. His analysis of Facebook's unfortunate stumbling with online privacy is a story that has legs. I will be curious to see where he takes his thoughts on Irish venture capital when he visits Silicon Valley next week. The Irish Venture Capital Association thinks ireland has the potential to become a venture capital hub  but those involved in small Web 2.0 start-ups believe that kind of scenario is far from reality. I'm not sure if John Collins gathers the tidbits called "InShort" but I think at least one of them every week provides me room for experimentation. This week, it's mention of Zinadoo's mobile sites. I need to play around with dot mobi site structures and the mobile version of XHTML for my main sites. Also, Dopplr has unveiled its mobile site and that probably deserves an inch of Irish Times coverage soon. 1. John Collins -- "Networking sites push limits on information" in The Irish Times, 30 November 2007. 2. John Collins -- "VC funding to surpass €3bn" in The Irish Times, 30 November 2007. 3. John Collins -- "InShort" inside the technology section of the Irish Times, 30 November 2007. UPDATED 30 NOV 07: Fixed broken URLs as pointed out by Will Knott. Now trying to change the settings on the mobile phone that caused the URLs to break. ALONG WITH 13 third level creative multimedia students, I will head to Limerick OpenCoffee for the year-end meet-up of Irish start-ups, UL interaction design students, and guests. We are interested in hearing about James Corbett's final preparations for the Paddys Valley tour, Shane McAllister's feasibility study, Cian Ginty's issues with blocked internet access (in telecon at left), Paul Sweeney's telco conference update and Gabriela Avram's ideas for a joint undertaking we plan to make. I have to choose my weekly travels and media trips carefully and that has resulted in me missing important events in Cork this week. I know from experience that when I treat my body like a yo-yo and overextend my travel commitments, I get sick and lose weeks of productivity in recovery. AFTER UPDATING DOPPLR with my intention to travel to Cork in early March 2008 for BlogTalk 2008, I saw some other names whose presentations I always enjoy. If a joint presentation about Jaiku wins approval, we will explain to our audience how third level creative multimedia students in Tipperary Institute used the Jaiku microblogging platform as a lightweight channel for co-ordination, peer review, and continuous assessment credit. Through five months of increasing activity, both student contribution and community cross-talk increased, leading to a higher level of learning than typically associated with online social networking. Three different lecturers participated in this development, setting "skunkworks" projects in motion and assessing the flow of student microblogging as set pieces in the curriculum. The end results suggest that microblogging in public can significantly enhance active learning while fostering online conversation skills considered essential in a knowledge economy. John Breslin -- "Premier Blogtalk Social Software Event Comes to Cork in March 2008"
I HAVE A SKYPE phone from Ireland's 3 Network in my pocket and appreciate its single-button Skype access. I can walk the dog outside my home and talk for free using Skype. However, that feature alone would not be enough to cause me to change my current usage of mobile phones. 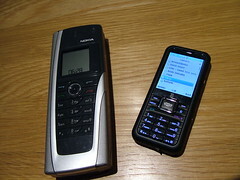 I have grown accustomed to the Nokia and SonyEricsson menus after five years of using those phones as part of my daily routine. I need a strong suite of business applications on my phones because I need to read documents created in Microsoft Office and distributed as Acrobat files. I need an on-board recording device on my phones. That's me and I know I'm not a typical mobile office warrior since few people carry two phones around with them every hour. The 3 Skype phone is a third phone in my daily kit bag and I have some first impressions to report. WE HAVE TO park this blog more often, by seeking out dead zones where internet access is so difficult to maintain that we simply walk, talk and enjoy the surroundings. Like Kitty at left, discovering the inviting couches of the Tate Modern. I returned to work feeling recharged, even though we had been disconnected for no more than 26 hours. Not only did I conclude that short time away cleared my mind, I also noted that visitors to both this blog and its photo albums jumped more than 10% on the day. Although I doubt that spike is related to my inactivity, the event proved something I knew long before. If you can tell a story in words or pictures, if you can offer advice in an easy-to-grasp manner and if you permit people to leave behind unmoderated comments, they will stop and graze. And Kitty--this is for you: thanks a million for sharing the updates you find of your youngest sister. We're telling her that you're taking care of her already. COMFORT OFTEN ARISES when you change locations so we trundled north from Cashel to enjoy a family occasion where mobile telephone coverage was no-bars strength. That meant I could neither make nor take voice calls but a trickle of Jaiku text messages occasionally made their way onto my phone. While with family friends, I realised that none of the 38 people sitting around me was part of my electronic social networks. Not a single cousin, aunt or uncle was "family" on Flickr. But all of them had received Christmas cards and birth announcements. They really appreciated the traditional hand-written touch and even after seeing images stored on my phone that also appear online, they would rather hold the photos in their wn hands. I imagine their reaction explains the booming photo-processing business in Irish chemists today. BECAUSE I HAVE A PILE of unread cuttings, I'm culling my Sunday readings today before my local newsagent opens his doors. That means I've pulled together snippets from several weekend sources that caught my eye for their relevance and timely coverage. After all, most of the content inside the Sunday papers was written and filed by Thursday so if you've read the Friday editions of Irish broadsheets you have a feeling for what will be covered in the Sunday paper rounds.